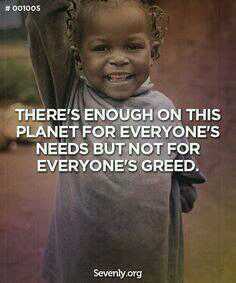 youth, arts and culture, issue-based, we all are affected by the ever increasing corruption and it must be stopped. to join the march in Keizergracht. and drums to participate both before the march starts and during the march itself. If you need any more reason to join the march read the article below, I’m sure it will hit home and make you realize that something drastic needs to be done. We have a voice, if we are UNITED we will be heard. Come let us UNITE AGAINST CORRUPTION. This entry was posted in Uncategorized on September 29, 2015 by shaunjengel. What if you reading this post and the world ended? 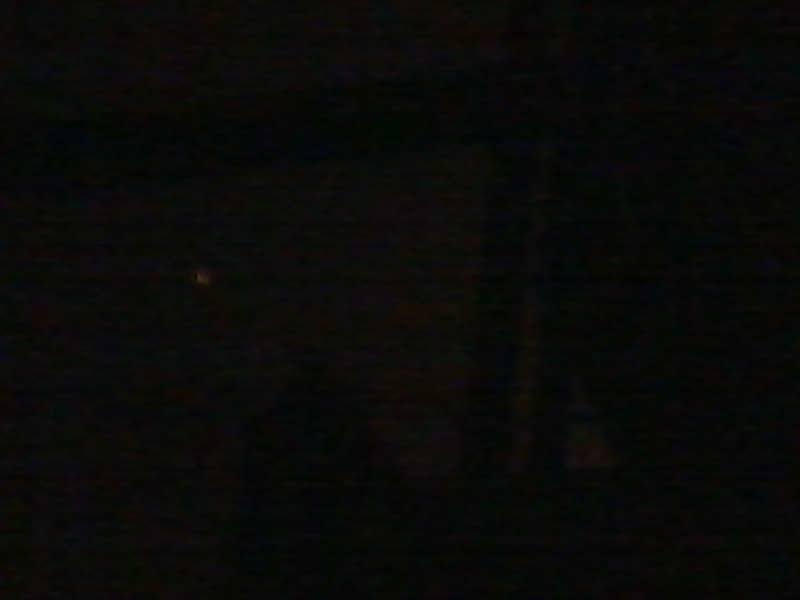 Ok don’t worry you still alive, yes there was a Super BloodMoon last night, a rare occurrence. The last one happened 33 years ago and the next one is predicted to be in 2033. If you looking for fast facts I’m no expert, infact I don’t even know what this means. I thought it had something to do with someone finding all the Dragon Balls. I did not want to miss the opportunity to see this once in lifetime occurrence….I was expecting blood though but what I saw was this..
Yeah uh limitations of my phone doesn’t do any justice to what I saw with my own eyes, your loss if you slept through it all hahaha (uh any cellphone companies or camera people want to sponsor me, you welcome). 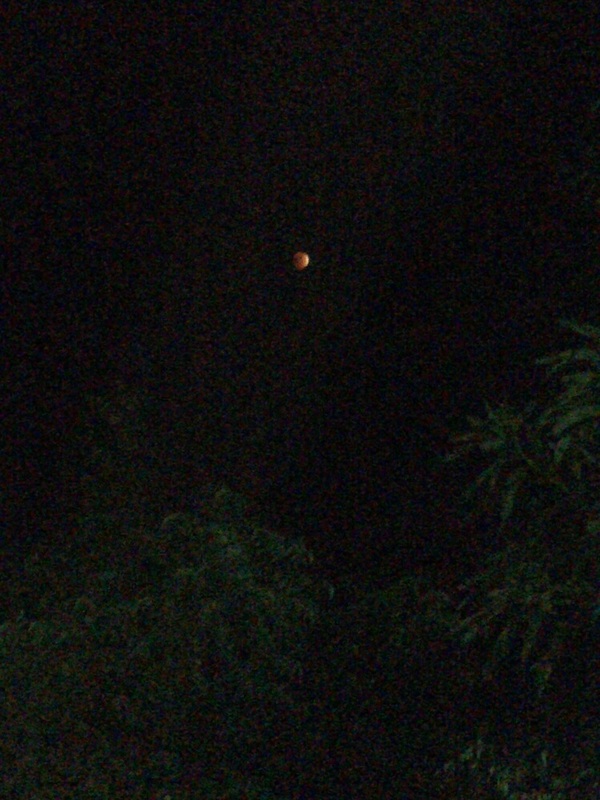 Apparently this was the fourth and last bloodmoon in a series spanning 2 years, nope I’m not talking about Teen Wolf or Twilight man, this is more like Pokemon – Gotta catch em all :-D.
…uh wait what? 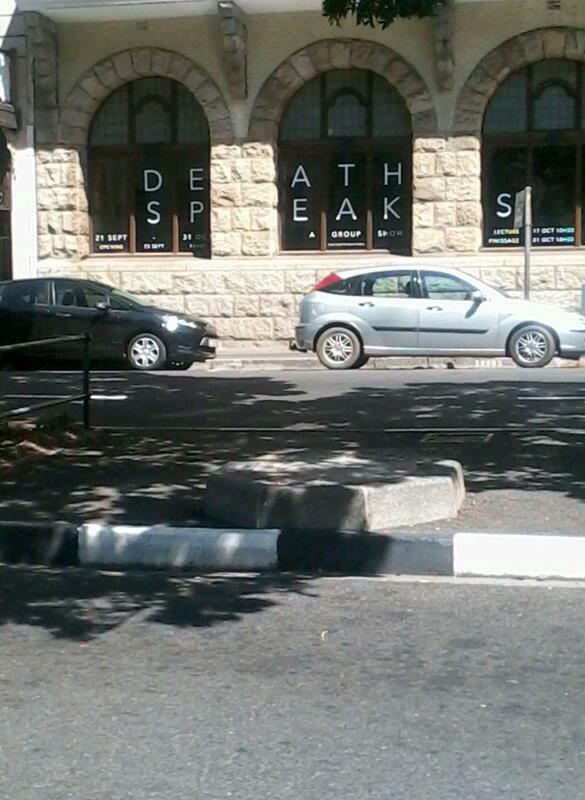 I can understand what is written above, no way this is amazing…. Ok just kidding I google translated that. What if ET flew past the moon last night that would’ve been awesome, wait so was that a Supermoon in the movie? That is what my cousin saw all the way from Colombia just goes to show there is only one moon, if you didn’t already know that now you know – you can thank me later ;-). What if they discovered life on another planet….hmmmm you in luck NASA just announced they found water on Mars, I guess this blood moon did bring about change….or is it all just a conspiracy theory? Your choice to believe what you just read above….I know I don’t, I just write what comes to mind and usually it makes sense other times, well you be the judge. This entry was posted in Uncategorized on September 28, 2015 by shaunjengel. 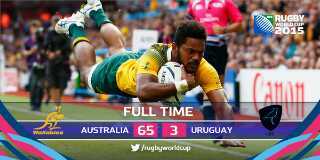 Day 8 of the Rugby World Cup 2015 saw a massive spate of tries, Australia who faced minnows Urugauy for the first time in history left them for dead with an 11 try thrashing. 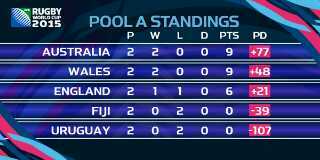 With Pool A ranked as the group of death Australia made sure of top spot before facing England next at Twickenham, this should be a mouth-watering contest after the host nation were narrowly defeated by Wales in a thrilling encounter of tough rugby last night. 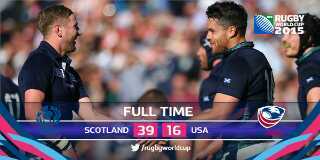 Next up was Scotland vs USA, the US put up a brave performance in the first half taking a 7 point lead at Elland Road into the break. USA have never led a Tier 1 side at half-time and have never beaten Scotland, will they make history today? The second half saw a more rampant Scottish side in what would be their second successive 33-point second half comeback. The Springboks without their captain Jean De Villiers who suffered a broken jaw after the Samoan game last night, better bring their A game for the full 80 minutes against this Scottish team when they face each other on the 3 October. 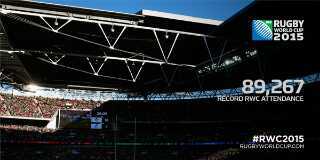 In a packed Wembley Stadium, a record-breaking crowd, beating the previous attendance record between New Zealand and Argentina. Today it was 6 Nations Champions Ireland taking on Romania, the 300th Match in Rugby World Cup History. 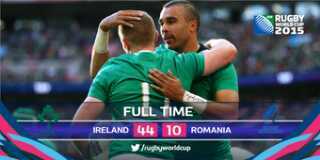 The Irish were too much for the Romanians as they put 6 tries past them but in the end Romania got a consolation try. The Final score 44 – 10 to the Irish as they join Scotland as the only teams to score maximum points in thier first two pool matches of the 2015 Rugby World Cup. After today’s matches the Australians lead the overall try standings with 14 tries followed by the Irish with 13. It was not all doom and gloom for Romania as Florin Surugiu took to his knee and proposed to his girlfriend, what way to do it – CONGRATULATIONS! This entry was posted in Uncategorized on September 27, 2015 by shaunjengel. After a sombre week, the Bokke came into this test hoping that history will not repeat itself but that stats would prevail at the end of their match against Samoa. An unbeaten record against Samoa and a few changes to the team that lost their opening 2015 World Cup match to Japan, once again the crowd and a Nation were behind the boys in Green and Gold. The Samoans tried to intimidate the Bokke with their war cry which in my opinion (no disrespect), is less threatening than the All Black Haka…the Bokke proved this as Pollard converted a penalty straight after the kick off. The Bokke looked a different team to last week probably because they knew what to expect, lots of physicality with De Allende having a good game. The 15th minute saw JP Petersen stroll his way over the line through an interception, hy lyk ‘n bietjie bulky vir my oppie wing maar hy het voor die World Cup gesé hy is ‘n ander speeler. De Villiers, captian fantastic, was denied a try after Willie Le Roux was tackled out of line in the corner, finally the Bokke have come to the World Cup. I don’t know why we as South African’s are surprised though. African Time guys, our boys got this. Four successful penalties by Pollard and a try by JP Petersen saw the half time score tick over at 17 – 6, Samoa converting 2 penalties. Last weeks team combined had 880 caps and Matfield contributed half those caps (joke), I don’t know what the coach put in the water…seems like Viagra because in the second half the Boks had more balls. They were more confident on the ball, opting to run the ball more. Willie Le Roux had a hat-trick of ALMOST tries denied but it was JP Petersen who made sure he crossed the line and placed the ball on the ground for his hat-trick. Veterans Schalk Burger and Bryan Habana both made history crossing the line for their 50th and 60th test tries respectively, Schalk Brits added his first. 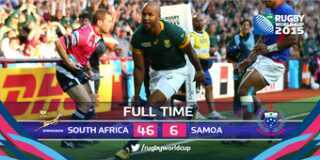 The Bokke were too much for Somoa today even player 23 joined in the 80th minute, must this player always be gesuip tss tss tss, Yes United We Shall Stand but we do not condone such idiocy from the fans. 14 points and a fine game at fly-half from Man of the Match, Pollard, together with 6 unanswered tries gave the Boks a convincing 40 point win. Soos Steve Hofmeyer sing – Win or Lose…Ek Bly ‘n Bok, vandag was hulle Bok Befo_Ok. Italy secured their 1st victory in Pool D after narrowly defeating Canada 23-18 at Elland Road in Leeds. 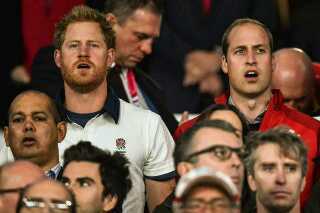 An intense game between England and Wales kept everyone on the edge of their seats even if you are Royalty. Wales came away with the 4 points beating England 28 – 25 but injuries could be a determining factor in the rest of their World Cup campaign. This entry was posted in Uncategorized on September 26, 2015 by shaunjengel. In a Pool that features the Mighty All Blacks this game between Argentina and Georgia was seen as a contest for second place in the Group. 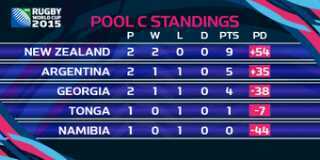 Georgia came into the game with no changes to the team that won Tonga in their first match. P Divvy former Springbok coach made some noise in the build up to the match but I heard him say that with no changes it seems like Georgia do not want to progress further than the group stages. He recommened that you at least give all of your players a run in the World Cup and it adds a little unpredictability for you opponents in my opinion. The first half saw Georgia keep the Puma’s at bay leaving the score 14 – 9 to Argentina, their first try coming in the 10th minute by Lavanini. Argentina also scored the first drop goal of the 2015 Rugby World Cup 13 games into the tournament. I have no idea what the coaches told their players in the half time break but one coach got it all wrong and the other inspired his team to a 6 try thriller. Argentina raked in 6 unanswered tries in the second half adding 40 points to the half time score annihilating the Georgian team 54 – 9 in the end. With Georgia still having to face the All Blacks after they crushed Namibia last night I think P Divvy was spot on, but hey we might see an upset, anything can happen within the 80 minutes ( unless the referee opts for TMO decisions). This entry was posted in Uncategorized on September 25, 2015 by shaunjengel. The First Time Namibia take on the All Blacks and the first time they playing in England, there was no surprise as to who would win this game it was just a matter of by how much. The Haka always an intimidating factor, the look of intent on the All Blacks faces proves their mission to sumbit their names into the history books and defend their title. It was once again the Sonny Bill Williams show as his off load brilliance secured some fantastic tries for the All Blacks, in the opening 10 minutes the score was already 15 – 0. The crowd erupted when Namibia scored their first penalty just proving that the underdogs have the opportunity to make a mark with massive support. They had some good moments in the game, positives against a rampant All Blacks side. To be honest in the second half my mind drifted as the scored board kept ticking the All Blacks way, I awoke to the roar of the crowd as Johan Deysel drove over the All Black try-line, this could be a highlight of his career. He was one of the stand out performers for Namibia in this game. At that point the score was 41 – 14. With no chance of a comeback the All Blacks scored a further, uh not sure lost count of how many tries were scored but it was a respectable scoreline to Namibia in the end….I predicted over the 100 points but this is 2015, teams are prepared and hungry to make an impact. Final Score 58 – 14 to New Zealand. This entry was posted in Uncategorized on September 24, 2015 by shaunjengel. A river runs through it..
Heritage day, a day celebrated in South Africa by having a braai with family and friends. I opted to spend the day learning more about my beautiful city through the Free Walking Tour. 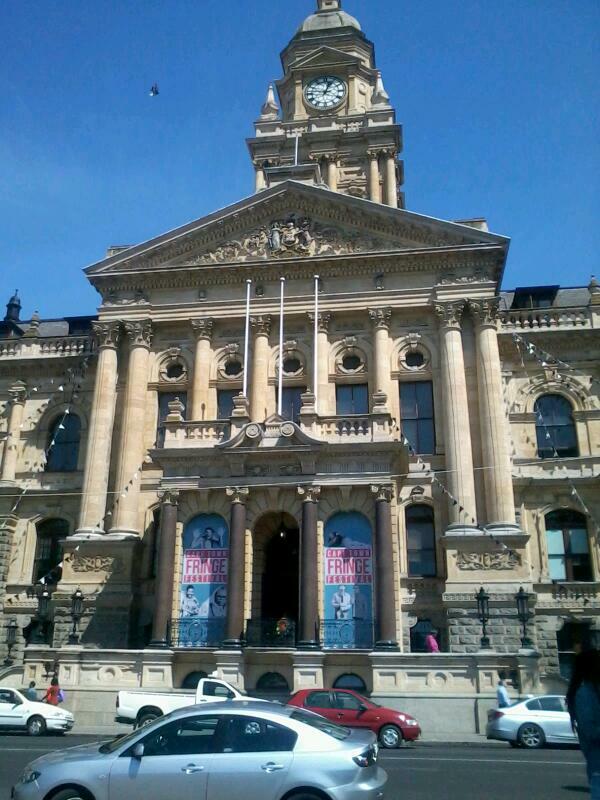 The Historical Walking tour takes you through the streets of Cape Town, walking in the footsteps of some of South Africa’s pioneers in what we have to be thankful for today. Starting off at Greenmarket square, the place of trade where you’ll find many souvenirs to take back home if you a tourist. We then moved on to St George’s Cathedral where we got a glimpse of a piece of the Berlin Wall donated to late President Nelson Mandela. On the steps of the Cathedral we got a little intro into the City by our knowledgable guide Paul, he explained the origin of Cape Town and introduced us to the history of.. He was seen as the first political prisoner on Robben Island and guess what he was a bit of a Micheal Scofield too as he escaped the prison. 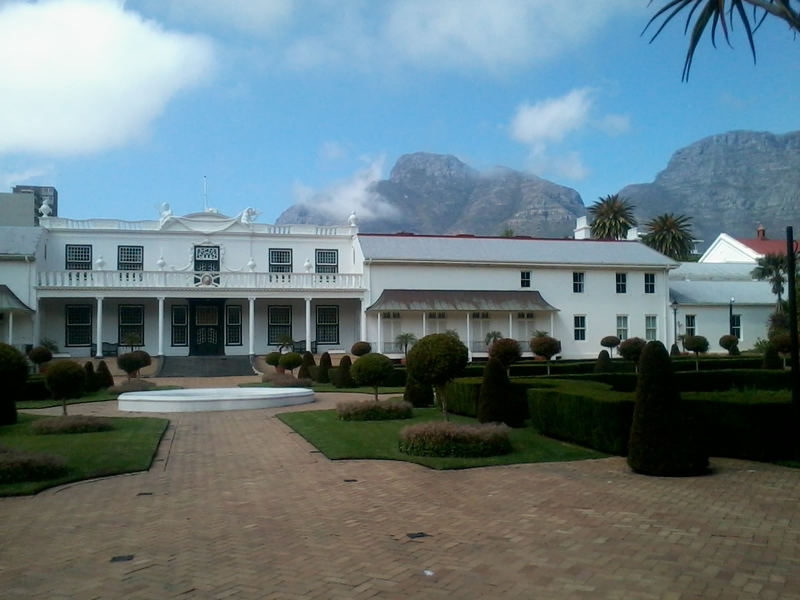 We then moved towards the Company Gardens here we got a glimpse of The White House..
Ok just kidding this our Presidents office (when in Cape Town, one of the 3 capitals of South Africa…you have to join the walk to find out the other 2.) also known as Die Tuin Huis. Through the gardens we stopped at the Slave Bell, this bell was rung as an acknowledgment to Slaves for payment, they were paid in Tobacco and Brandy. We also learnt that about the oldest pear tree +-360 years old and still bearing fruit for the many squirrel to enjoy. 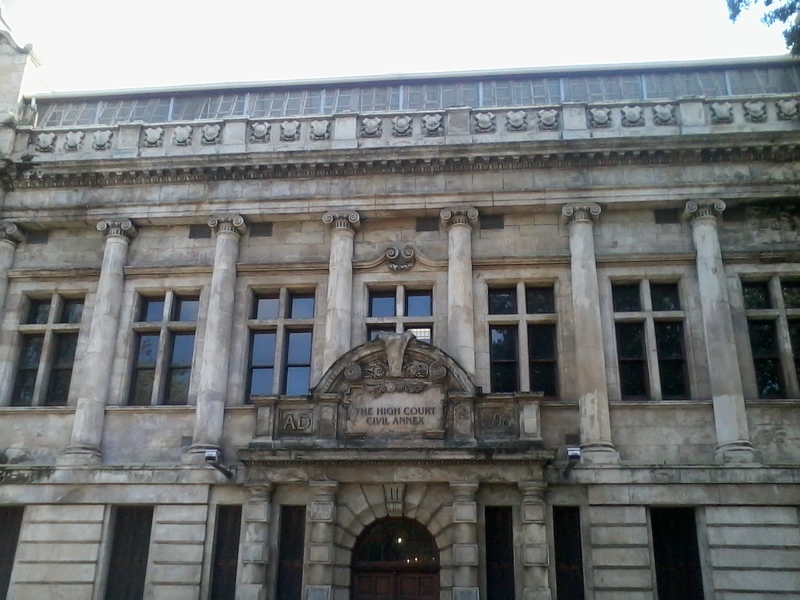 Next we stopped at the Cape High Court, this was where the mood dropped as the discussion of Apartheid came to the fore. Many questions were asked and answered and if we stayed any longer it would’ve turned into an entertaining debate as Racial Classification, Immorality Act and Group Area’s Act were explained to us by Paul. Highly informative for anyone visiting South Africa and if, like myself a tourist in your own city. We moved on to the Red Light District of Cape Town, this I did not know but Church Square, opposite the Slave Lodge was a place for some seedy activity back in the day. 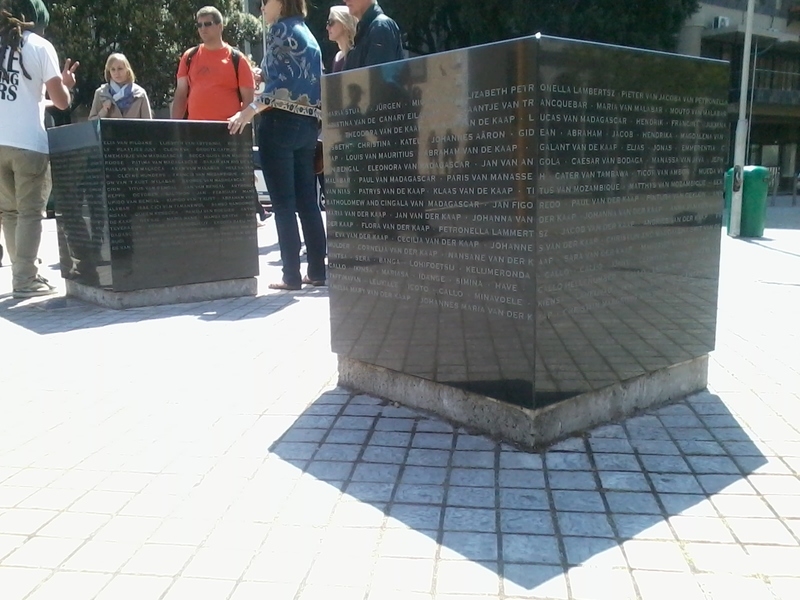 This is a monument to some of the many slaves, we learnt about one woman in specific Eva van Den Kaap the first princess of Cape Town and also Family of Autshumato. This was where the slaves were sold, a sunday was the preferred day for buying and selling slaves. I thought the background in the picture Death Speaks is fitting with this monument as Slavery to me is inhumane, if we could hear from these slaves today they would have many deathly stories to tell I’m sure. 11 February 1990 Nelson Mandela took to the steps and addressed a quarter of a million people after being released from Robben Island, he concluded with the following words.. 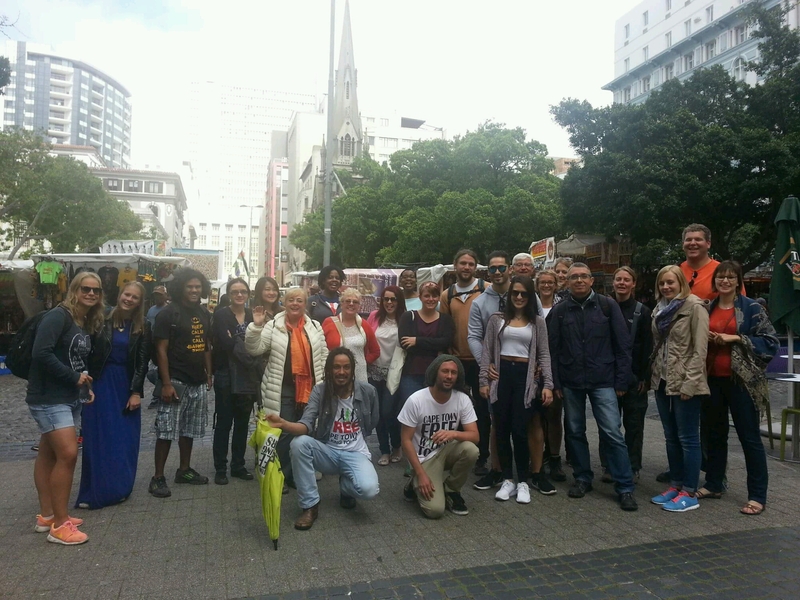 This is a highly recommended tour, you will not be disappointed, Cape Town has a rich history just walking through it will open your eyes to a different world and who knows you might make some new friends in the process. I enjoyed my Heritage Day in a fullfilling manner.